Listening to the myriad of wonderful podcasts out there is a great thing, but having all those podcasts take up tons of space on an iPhone or iPod touch isn’t so great. Each episode of an audio podcast can easily run between 30MB to 90MB depending on the length of the show, so it’s not uncommon for a sizable podcast library to slowly accumulate into GB’s of storage taken up, particularly if you’re not going through and manually trashing the ones you don’t need anymore as part of a routine to free up storage capacity on your iOS devices. A simpler hands-off solution to this podcasts storage problem is to set the Podcasts app to automatically delete episodes once they’ve been played through. Since we typically only listen to a podcast once, there’s little need to store old episodes on your device forever, especially when it’s so easy to download them again anyway. This is dependent on having the Podcasts app installed in iOS, if you’re using an older version of iOS that doesn’t support the newer podcasts app then you won’t find these options available. For anyone with a sizable podcast subscription base, this will free up tons of space as all the episodes you already listened to will be automatically removed. If you want to know just how much storage is taken up, and consequently saved, take a gander at the usage section for Podcasts both before and after you make the adjustment for played episodes. 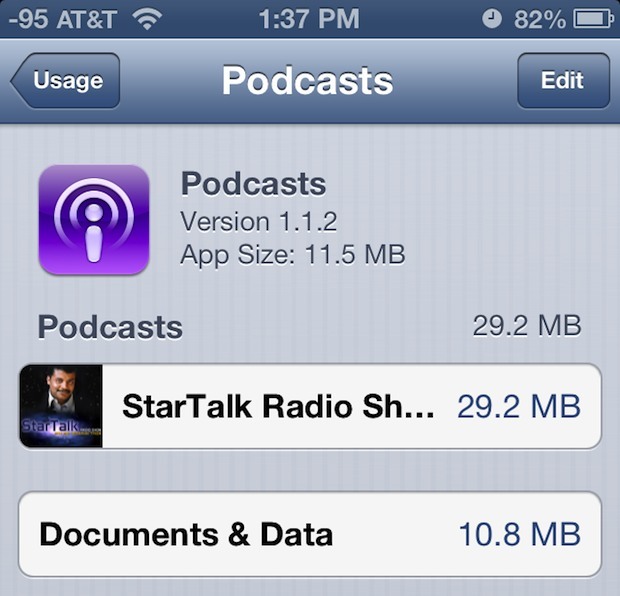 I was able to free up 900MB of space on an iPhone by switching the setting as mentioned above, and that was by whittling down from about 12 older StarTalk episodes to a single unplayed episode. 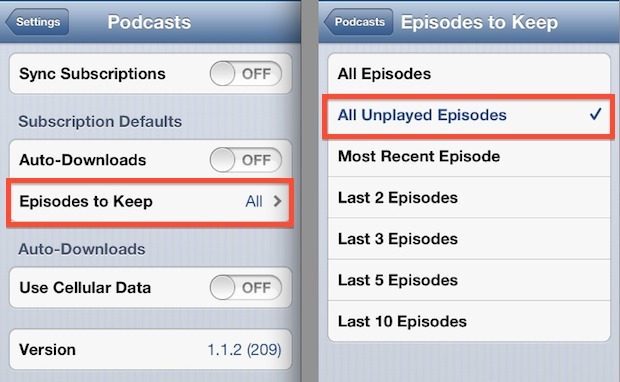 Obviously if you have a ton of podcast subscriptions you’ll notice an even larger space savings, making this settings adjustment even more important. For some reason this does not work on my iPhone 4S. The played podcasts do not automatically delete. I also realized that the phone can stream the podcasts directly instead of downloading them first. I also have the same problem with the Podcast app. It will not auto delete any podcasts. Any suggestions.